This post is going to be about how I got those fishies to sing “under da sea” in my belly. Here’s a quick and easy salmon recipe. 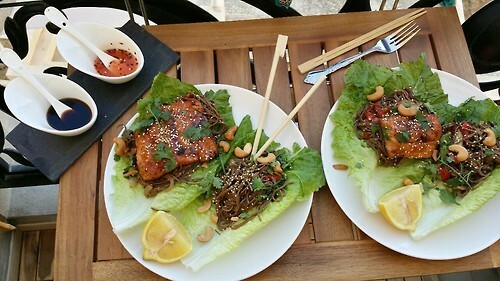 I made teriyaki salmon with a simple yet healthy soba-noodle salad and it was mighty fine if I do say so myself. It’s an easy and healthy dinner/lunch recipe to have in your culinary repertoire. So first things first, you need to get the salmon in a marinade and let it soak up all those flavors for at least 30 minutes before cooking. The longer the better. – For the marinade, grab a Ziploc baggie, and pour in ¼ cup of soy sauce, a swig of honey, a pinch of chili flakes, some grated ginger and a grated clove of garlic and just let those babies dye themselves in the soy sauce. – As for the soba noodle salad, I promise you it could not be easier. Soba noodles need exactly 6-7 minutes to cook so if you’re a slow chopper, I suggest you cut everything up before you put the noodles to cook. – Boil the noodles and after they are cooked drain them and wash with cold water. – Get started on the salmon, just braising it by searing it on a high heat on both sides and then pouring the marinade liquid to let boil gently until just flaky and cooked. – On a high heat (and preferably in a wok pan) pour some sesame oil and cook the bell peppers for 1 minute; then, add the ginger and garlic and noodles. Flip a few times, then add some soy sauce and toss a few more times. Then turn off the heat, and sprinkle sesame seeds, spring onions, and coriander and you are in business. These quick and easy salmon or seafood recipes are really good to have on you if you’re swamped and hungry–so you have a quick lunch or dinner to put together! Previous Post Swim into My Belly, Little Fishies!